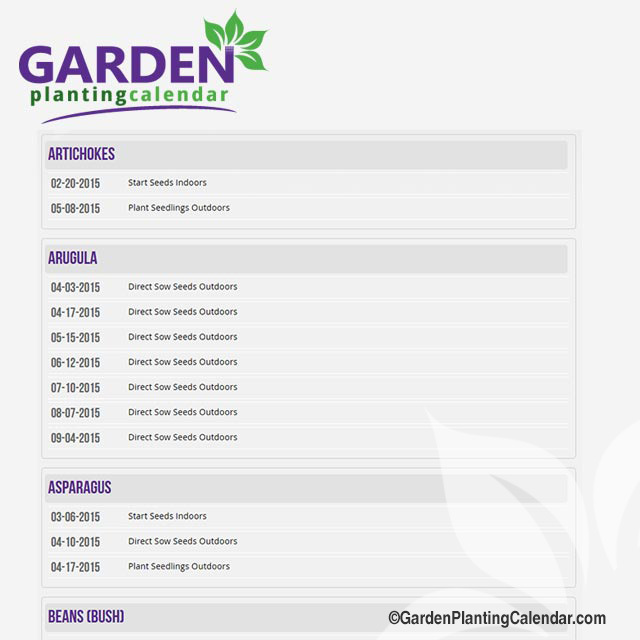 Our Garden Planting Calendar system creates a customized calendar for your garden by calculating your estimated last frost date and putting together a personalized schedule for you based on the types of plants you want to grow and how you want to grow them. 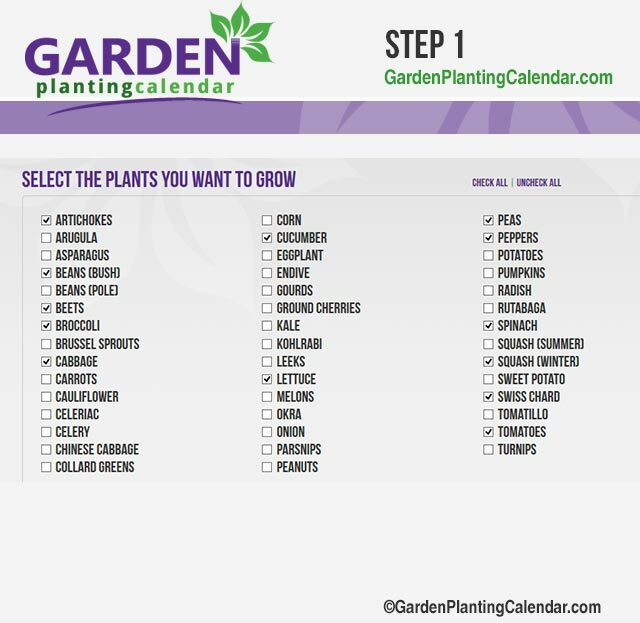 Your individual garden calendar will show when you should start (indoors and outdoors) the specific seeds and seedlings you would like to grow in your garden. It's easy and convenient! Give Us Your Garden's Zip Code & We'll Calculate Your Growing Season For You. Our system uses data based on the US National Oceanic and Atmospheric Administration (NOAA) "Climate Normals" to calculate the average first and last frost dates for your US garden location. NOAA's "Climate Normals" are calculated using the latest three-decade averages of data collected at various weather stations throughout the United States. Although there can be fluctuations in frost dates across different years and in micro-climate areas, NOAA's "Climate Normals" averages are good estimates for predicting when the first and last frost will occur in your location. These dates are averages only and not absolutes. What Risk of Frost are you Willing to Take? 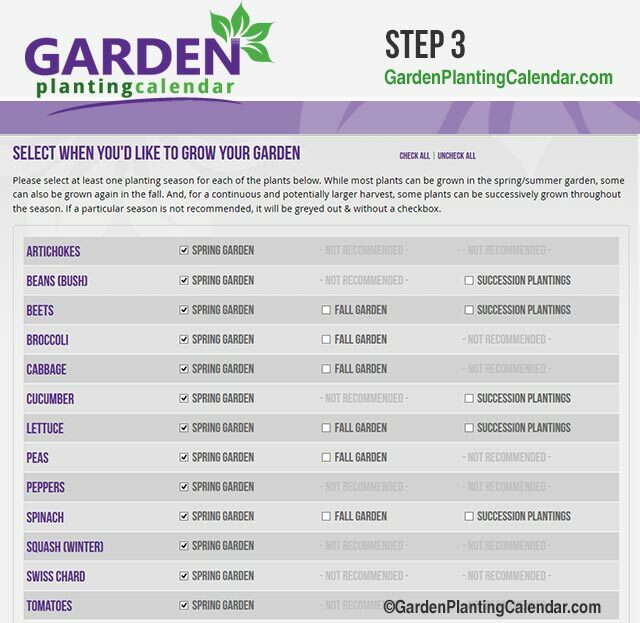 Unlike other online garden planning calendars, our system gives you more control over when you want to start your garden and the amount of risk of frost you are willing to take for your seeds and plants. Our garden planting calendar software allows you to select from different levels of frost probability for your location when creating your calendar. You can select dates where there is a 10%, 20%, 30%, 40%, or 50% chance of a frost occurring after the calendar start date. You simply pick the level of risk you want to use for predicting frost at your garden's location and we take it from there! Let Us Know What Plants You Want to Grow. Select From Our Growing Database of Different Fruits & Vegetables! 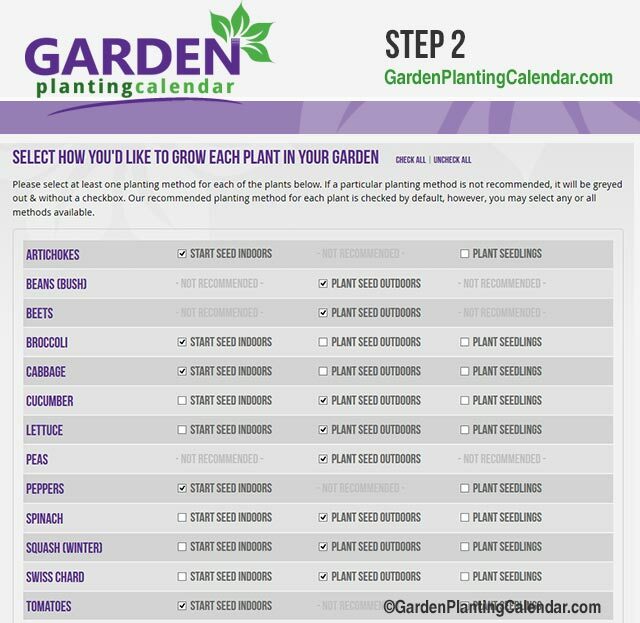 We have an extensive and growing database of vegetables and fruits that you can select from to create your planting calendar. You simply check which plants you want to grow and those are the only plants that will appear in your calendar. No wading through unnecessary information about plants you don't want to grow! Our software keeps your garden calendar organized and personalized just for you making it much easier for you to read and follow! Our garden calendar system includes planting dates for both spring and fall gardens as well as the ability to plan and plant crops successively for a longer and more consistent harvest. You can select which plants you would like to start from seed indoors, which plants you would like to direct sow by seed outside, and which plants you would like to grow from seedlings. We will calculate dates for each growing method depending on your individual preferences. 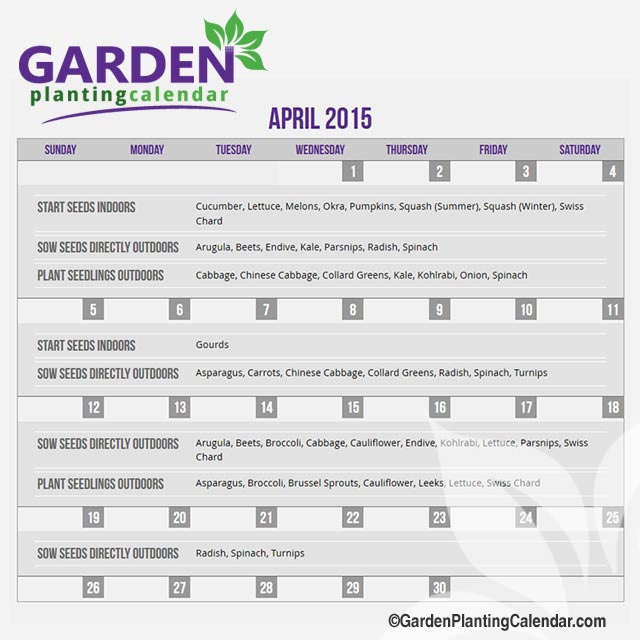 Our garden planting calendar is truly customized for your garden! 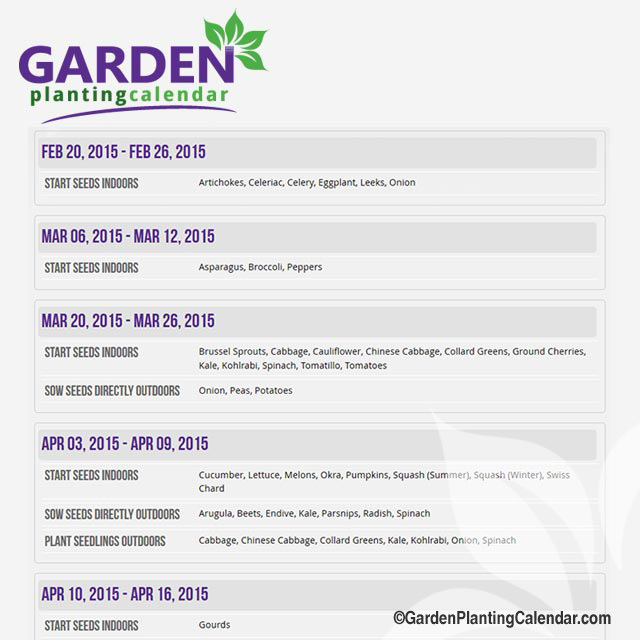 We'll Create a Custom Garden Planting Calendar Just for You, Your Location, & the Plants You Want to Grow. After entering your location, selecting the frost probability you want to use to determine your planting dates, and selecting your plants and how you would like to grow them, creating your calendar is as easy as pushing a button! No more manually entering frost dates on paper and then counting back or ahead several weeks to determine when you think you should start seeds or plant your seedlings. Using our garden planting calendar makes planning your garden easy and fun, allowing you to spend more time growing and less time calculating dates (and fretting when you've forgotten or miscalculated).